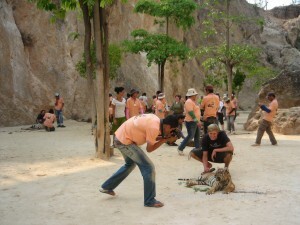 Update: The Tiger temple has been closed down due to controversy. 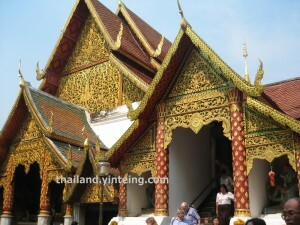 Also known as Wat Pa Luangta Bua, the temple is located in Kanchanapuri. 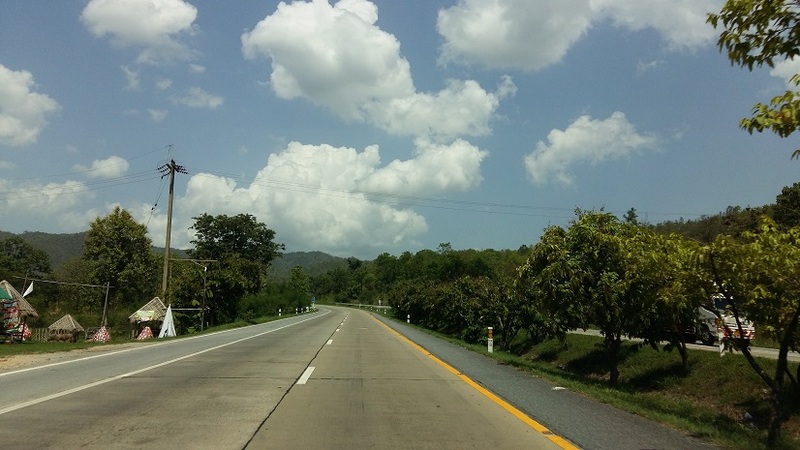 Kanchanapuri is a town that is located about 120km from Bangkok. 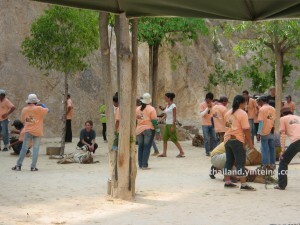 The entrance fee for foreigners is 500 baht per person. 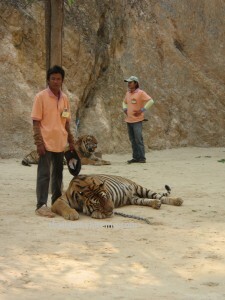 But the fee is well used as it is used to feed the tigers and numerous animals staying there. Consider it as a donation to help out on the expenses and to feed the animals in the temple. 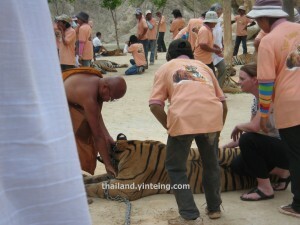 We were fortunate that the abbot was there too, personally attending to the tigers. 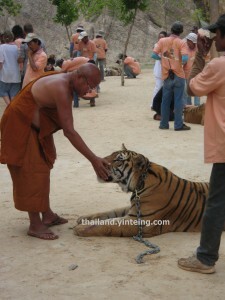 The abbot is very compassionate- the tigers are obedient. Those in orange Tshirts are the caretakers. Each tiger has it individual caretaker- the tiger recognise its caretaker by his/her scent. Therefore, the caretaker must hold the hand of the visitor- while approaching the tiger. The tiger would not feel threatened. Else, it may act aggressively. 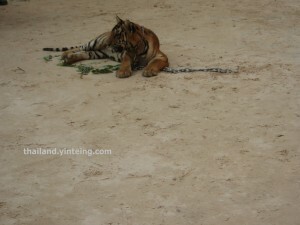 Even though the tigers are chained to the ground, they are not ill treated. 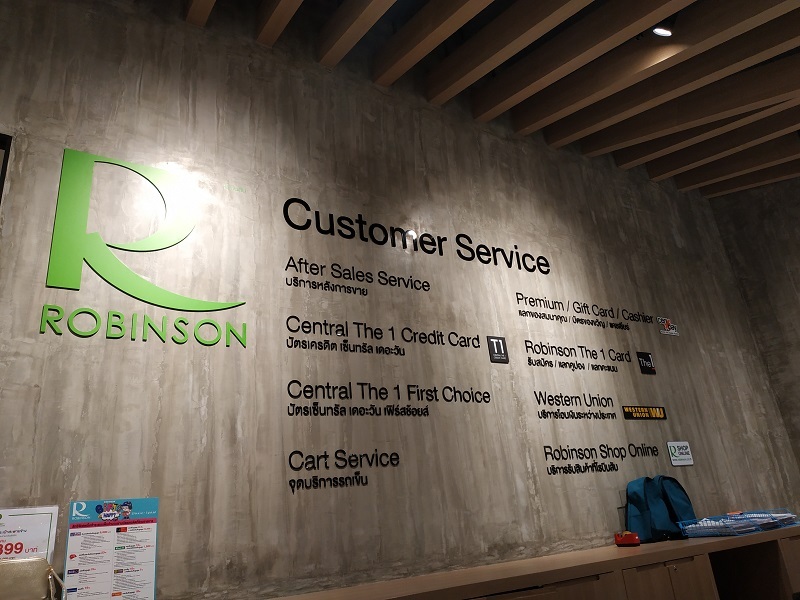 You will not be allowed to bring in your bag in the area- you can have a camera and arrange for the caretaker to take a photograph for you. The caretakers are quite expect- when they took photograph for me, it was done quickly and accurately. See, the two tigers look relaxed. At a certain time, all the tigers are led back – they do not stay outside the whole time. In the evening, as if on cue, wild animals will run in from nearby forest for a meal. 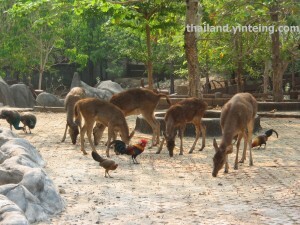 The food they are nibbling on comes from the 500 baht entrance fee that you pay. I was told that these animals are not residents of the temple- they are from nearby forests- and they seemed to know it is safe here and that it is time for their meal. Horses, deers, wild boars and other animals came to graze on the food. 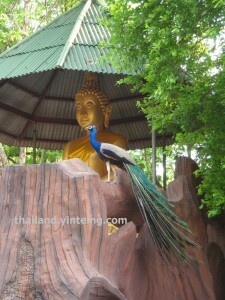 Nice peacock posing next to the Buddha statue. This area is a new area that the abbot is constructing to give more animals a home. Please note the temple also have a magazine (in Thai and partial English language). More information can be obtained via their website: www.tigertemplemagazine.com.